India’s political scene has been changing rapidly in recent years. 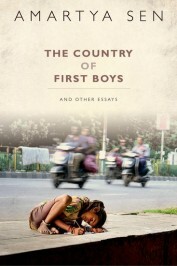 In the extract from The Country of First Boys And Other Essays below, Amartya Sen reflects on the triumphs and failures of Indian democracy. We have reason to be proud of our determination to choose democracy before any other poor country in the world, and to guard jealously its survival and continued success over difficult times as well as easy ones. But democracy itself can be seen either just as an institution, with regular ballots and elections and other such organizational requirements, or it can be seen as the way things really happen in the actual world on the basis of public deliberation. I have argued in my book The Argumentative Indian that democracy can be plausibly seen as a system in which public decisions are taken through open public reasoning for influencing actual social states. Indeed, the successes and failures of democratic institutions in India can be easily linked to the way these institutions have—or have not—functioned. Take the simplest case of success (by now much discussed), namely, the elimination of the large-scale famines that India used to have right up to its independence from British rule. The fact that famines do not tend to occur in functioning democracies has been widely observed also across the world. How does democracy bring about this result? In terms of votes and elections there may be an apparent puzzle here, since the proportion of the population affected, or even threatened, by any famine tends to be very small—typically less than 10 percent (often far less than that). So if it were true that only disaffected famine victims vote against a ruling government when a famine rages or threatens, then the government could still be quite secure and rather unthreatened. What makes a famine such a political disaster for a ruling government is the reach of public reasoning and the role of the media, which move and energize a very large proportion of the general public to protest and shout about the ‘uncaring’ government when famines actually happen—or come close to happening. The achievement in preventing famines is a tribute not just to the institution of democracy, but also to the way this institution is used and made to function. Now take some cases of lesser success—and even failure. In general, Indian democracy has been far less effective in dealing with problems of chronic deprivation and continuing inequity with adequate urgency, compared with the extreme threats of famines and other emergencies. Democratic institutions can help to create opportunities for the opposition to demand—and press for—sufficiently strong policy response even when the problem is chronic and has had a long history, rather than being acute and sudden (as in the case of famines). The weakness of Indian social policies on school education, basic health care, elementary nutrition, essential land reform, and equal treatment of women reflects, at least partly, the deficiencies of politically engaged public reasoning and the reach of political pressure. Only in a few parts of India has the social urgency of dealing with chronic problems of deprivation been adequately politicized. It is hard to escape the general conclusion that economic performance, social opportunity, political voice, and public reasoning are deeply interrelated. In those fields in which there has recently been a more determined use of political and social voice, there are considerable signs of change. For example, the issue of gender inequality has produced much more political engagement in recent years (often led by women’s movements in different fields), and while there is still a long way to go, this development has added to a determined political effort at reducing the asymmetry between women and men in terms of social and economic opportunities. There has been more action recently in organized social movements based broadly on demands for human rights, such as the right to respect and fair treatment for members of low castes and the casteless, the right to school education for all, the right to food, the entitlement to basic health care, the right to information, the right of employment guarantee, and greater attention on environmental preservation. There is room for argument in each case about how best to proceed, and that is indeed an important role of democratic public reasoning, but we can also see clearly that social activities are an integral part of the working of democracy, which is not just about institutions such as elections and votes. A government in a democratic country has to respond to ongoing priorities in public criticism and political reproach, and to the threats to survival it has to face. The removal of longstanding deprivations of the disadvantaged people of our country may, in effect, be hampered by the biases in political pressure, in particular when the bulk of the social agitation is dominated by new problems that generate immediate and noisy discontent among the middle class Indians with a voice. If the politically active threats are concentrated only on some specific new issues, no matter how important (such as high prices of consumer goods for the relatively rich, or the fear that India’s political sovereignty might be compromised by its nuclear deal with the United States), rather than on the terrible general inheritance of India of acute deprivation, deficient schooling, lack of medical attention for the poor, and extraordinary undernourishment (especially of children and also of young women), then the pressure on democratic governance acts relentlessly towards giving priority to only those particular new issues, rather than to the gigantic persistent deprivations that are at the root of so much inequity and injustice in India. The perspective of realization of justice is central not only to the theory of justice, but also to the practice of democracy. To conclude, the idea of justice links closely with the enhancement of human lives and improving the actual world in which we live, rather than taking the form, as in most mainstream theories of justice today, of some transcendental search for ideal institutions. We will not get perfect institutions, though we can certainly improve them, but no less importantly, we also have to make sure, with cooperation from all sections of the society, that these institutions work vigorously and well. Engagement with reasons of justice is particularly critical in identifying the overwhelming priorities that we have to acknowledge and overcome with total urgency. A good first step is to think more clearly—and far more often—about what should really keep us awake at night. This extract from The Country of First Boys is a slightly abridged and edited version of the inaugural Professor Hiren Mukerjee Memorial Annual Parliamentary Lecture, titled ‘Demands of Social Justice’, delivered in the Central Hall of Indian Parliament on 11 August 2008. It first appeared in The Little Magazine: Speak Up , volume VIII, issues 1 and 2 (2009), pp. 8–15. Featured image: Sandstone Hills crevasse. CC0 via Pixabay. Amartya Sen, one of the world's foremost thinkers, teaches economics and philosophy at Harvard University, and was earlier Master of Trinity College, Cambridge. He has served as President of the American Economic Association, the Indian Economic Association, the International Economic Association, and the Econometric Society. His awards include the Bharat Ratna (India), Commandeur de la légion d'honneur (France), the National Humanities Medal (USA), Honorary Companion of Honour (UK), Ordem Nacional do Mérito Científico (Brazil), and the Nobel Prize in Economics. He is the author of, most recently, The Country of First Boys And Other Essays.